How many portions would I get from my cake? 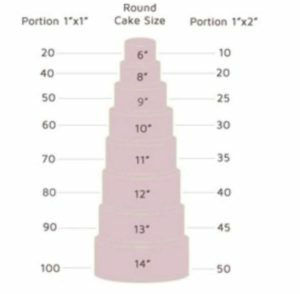 How much do your cakes weigh? We have never weighed them but would be happy to provide an estimate for your cake table, stand etc. Please keep in mind, they are pretty heavy. For collection, we recommend you hold them from the bottom of the box (never in carrier bags!) or lay them on a flat surface. For wedding cakes – once we have set them up for you, we recommend they stay there. Why do you not have a shop front? We are a purely online business because we would like to save on extortionate rents and rates and pass it on to you the customer! How long a notice do you require? For anything other than a wedding cake, we require a minimum of 48 hour notice (subject to availability). We strongly advise you to book your cake in good time to avoid disappointment as summer months are extremely busy for us. Generally, 3-4 months before the wedding is a good time. However, as mentioned before, for summer months, book as soon as you feel ready. Do you provide a knife and cake boxes? No. We never provide cake boxes and/or knives/slicers/servers. They are very cheap and readily available from many online retailers and high street shops. Do you offer vegan friendly wedding cakes? Yes we do offer vegan friendly cakes. However, design options will be limited. Please contact us to discuss your dietary requirements. Can you deliver my wedding cake and how much do you charge for delivery? Yes we offer delivery on our wedding cakes (with the exception of a small selection of our “Pretty on Budget” creations. We strongly recommend delivery on all wedding cakes, however, you are very welcome to collect your wedding cake from our premises in Ilford, East London. All wedding cakes are securely packaged and we advise at least two people should come to collect the cake for safe handling and transport. Rest assured, there are no extortionate delivery and set up charges. We cannot publish a flat fee for our delivery charges as there are literally hundreds of venues across the capital. Please contact us with your exact venue address and we will work these out for you. We take pride in not charging extortionate amount for delivery to encourage delivery and set-up as it’s the safest and best option for your wedding cake. Delivery charges depends on the distance from IG3 8PW to your venue. Can I have my wedding cake in more than one flavour? Absolutely. With the exception of a few flavours (red velvet, pistachio, walnut and fruit cake), there is no extra charge for this service. How do I place an order for a wedding cake? We invite you to a complimentary tasting and design consultation to ensure you are fully satisfied with our service and flavours. We will provide you with 5-6 of our moxt popular flavours which should give you a good indication of the sponges and fillings we offer. Regretfully, we will not be able to provide more flavours. Once you are happy with your chosen cake flavours, we will send you a sketch of your cake design along with with our suggestions on slight design changes to offer a price flexibility. We would require a 50% deposit to book your wedding cake, which is fully refundable within 14 calendar days. The remainder of the payment is needed at least two calendar weeks before your date.